The definitive vampire story is presented with extra material including the history of vampires, myth-busting, and how to defend oneself from a vampire visitation The door is shut, and the chains rattle; there is a grinding of the key in the lock; I hear the creaking of lock and bolt . . . I shall not remain alone with them. I may find a way from this dreadful place, away from this cursed spot, from this cursed land, where the devil and his children still walk with earthly feet. Young lawyer Jonathan Harker travels to Transylvania on business for a mysterious Count. Months later in England, beautiful Lucy Westenra falls ill and dies, inexplicably, as if from a severe loss of blood. Lucy's friends, including Jonathan's fiancee Mina and the intrepid doctor Van Helsing, must begin a desperate battle against a powerful, ancient evil, in Bram Stoker's definitive gothic tale. 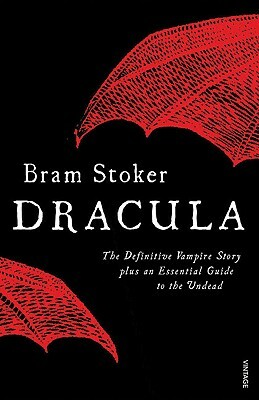 Bram Stoker (1847-1912) is also the author of The Jewel of Seven Stars and The Lair of the White Worm. "Those who cannot find their own reflection in Bram Stoker's still-living creation are surely the undead ." "An exercise in masculine anxiety and nationalist paranoia, Stoker's novel is filled with scenes that are staggeringly lurid and perverse.... The one in Highgate cemetery, where Arthur and Van Helsing drive a stake through the writhing body of the vampirised Lucy Westenra, is my favourite." "It is splendid. No book since Mrs. Shelley's Frankenstein or indeed any other at all has come near yours in originality, or terror."